Salads Your Kids Just Might Eat! There’s just something about salads that — there’s no other way to say it — many kids don’t particularly enjoy. I found that combining small amounts of raw vegetables with starchy comfort foods like pasta, bread, or potatoes, or adding fresh or dried fruit, helped to entice my kids and their friends to give salads a try. As far as tossed green salads, the best way I found to entice them was to offer a very simple homemade Thousand Island dressing with it. Unfortunately, lots of kids and teens who want to be vegetarian or vegan claim that they don’t like vegetables. It’s our job to gently and persistently help them overcome that aversion. If your kids aren’t receptive to salads at any given time, let it go and revisit from time to time. And in the interim, keep serving platters of raw veggies and dip—something lots of kids like—and plenty of fresh fruit. 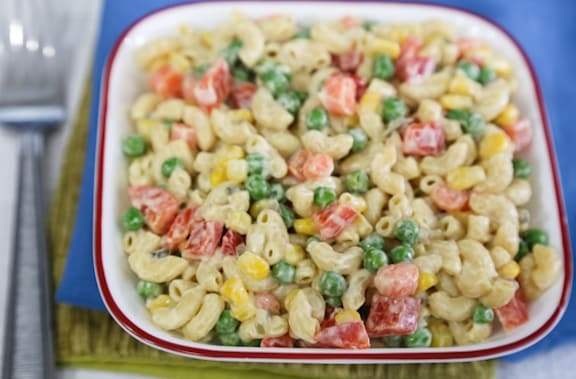 A mild and simple macaroni salad, this is reminiscent of the kind sold at deli counters, but with more going for it. This simple pasta salad goes well with many types of bean and vegetable dishes, and is good for school lunch as a change-of-pace from sandwiches. See the photo at top, for which we used Tolerant’s gluten-free organic green lentil pasta, just one of several such high-protein, legume-based pastas. Adapted from The Vegetarian Family Cookbook. Cook the in plenty of steadily boiling water until al dente, then drain. Rinse under cool water, then drain again and transfer to a serving container. Combine half of the vegetables with the cooked pasta. Add the mayonnaise and mustard and stir together. Season gently with salt, then scatter the remaining vegetables over the top. Serve at once or cover and refrigerate until needed. Variation: You can substitute the veggies listed above with others that your kids might enjoy, such as green beans, broccoli, summer squash, etc., so long as they are cut into very small pieces. 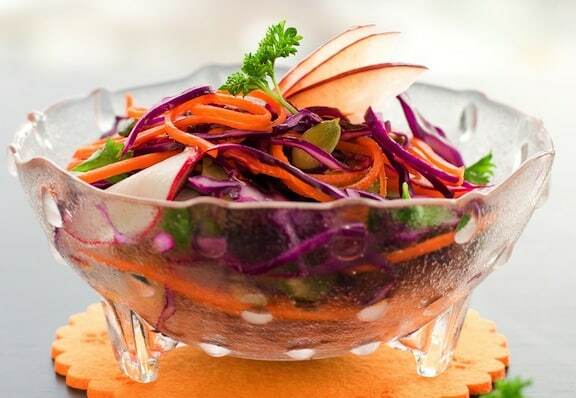 Adding sweet elements to raw vegetables can be a good way to entice kids to give salads a try. Adults will like this one, too—it provides a nice flavor contrast to spicy dishes. Combine all the ingredients in a serving bowl and mix well. Let the salad stand for 15 to 20 minutes before serving to allow the flavors to mingle. Here’s a simple salad that might just be the first your kids will enjoy. A food processor is a must for preparing this salad quickly. See photo at the top of the page. 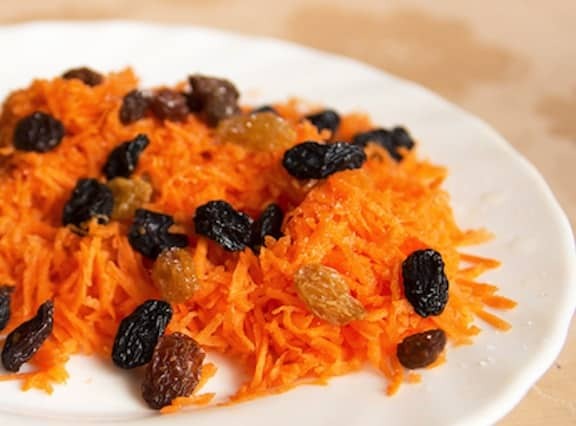 Grate the carrots in a food processor, then transfer to a serving bowl. Add the remaining ingredients, and mix together thoroughly. Let the salad stand at room temperature for 20 to 30 minutes, then serve. Variation: Use raw sweet potato in place of the carrots. Yes, sweet potato is delicious raw! 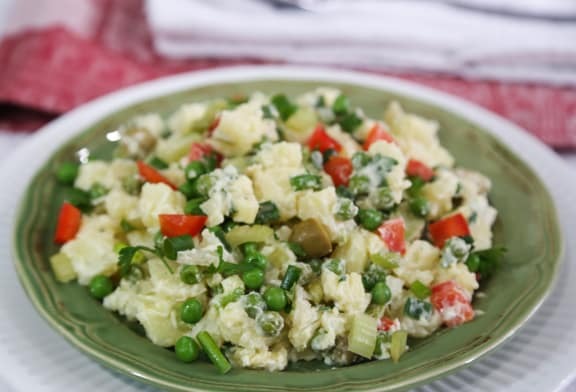 A creamy potato salad dotted with colorful veggies might be just the thing to tempt budding salad eaters. If you’d like to keep the skins on the potatoes, scrub them well. Microwave or bake the potatoes in their skins until done but still firm. Let the potatoes cool to room temperature. If you prefer to use peeled potatoes in the salad, slip their skins off when they’re cool enough to handle. Dice the potatoes into approximately 3/4-inch chunks, and place them in a serving container. Add the remaining ingredients and mix gently but thoroughly. Serve at once or cover and refrigerate until needed. Variation: Substitute a sweet potato for one or two of the regular potatoes. I just wanted to thank you for such great recipes and resources. We,my family and I, ate new to vegetarian cooking and your book The Vegetarian Family Cookbook has been great, with things my kids will eat! Thank you, thank you, thank you! A grateful and happy mom! I have been doing my best to get my kids love veggies and fruits again. I have to try this one and I hope they’ll love this. Thanks for sharing! These are fun and exciting recipes. I can’t even decide yet which to do first and prepare it for my kids. I love the idea of making kids the inspiration for these recipes. I hope my kids would love this. I will do my best to keep my kids healthy. Thanks for sharing!